President George H.W. 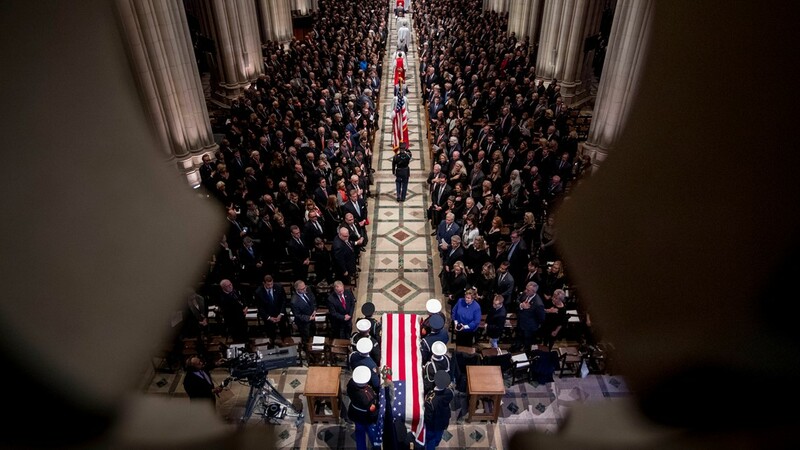 Bush was remembered during a funeral at the National Cathedral in Washington D.C. A second service will be held in Houston on Thursday before Bush is laid to rest in College Station. The 41st president is back home in Texas, where he'll be buried in College Station on Thursday. Overnight, George H.W. Bush's body was lying in repose at St. Martin's Episcopal Church in Houston, where his second state funeral will be held Thursday morning. He'll later be taken by train to College Station, where he'll be buried on the grounds of his presidential library. Bush's casket was loaded onto a train in Spring, just outside of Houston, about 12:45 p.m. for his final ride to College Station, where he will be buried. The train is a custom locomotive – No. 4141, built in Bush's honor. The route will pass through several small towns along the way to College Station. Oak Ridge Boys sing "Amazing Grace"
George P. Bush, the grandson of George H.W. Bush and now the Texas Land Commissioner, eulogized the man he called "Gampy," remembering their days spent together at the family home in Kennebunkport, Maine. George H.W. Bush fished with his grandchildren and held horseshoe matchups, the grandson said. And he could usually be found snacking on pork rinds and Blue Bell ice cream and Klondike bars. He was a true family man, George P. Bush said. When George P. Bush joined the Navy, his former Navy pilot grandfather was proud. "Our service never compared to his, yet we could never convince him of that," George P. Bush said. "He left a simple, yet profound legacy: Service." Bush's longtime friend and former Secretary of State, Jim Baker, was the first to eulogize the 41st President in Houston. 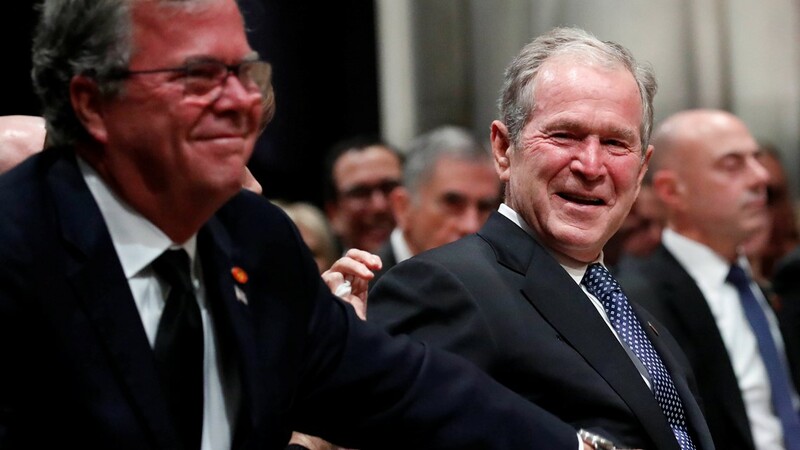 The two had been friends for decades, and Baker was with Bush when he died last week. Baker called Bush "a truly beautiful human being." "He was a leader and he knew it," Baker said. A special message on funeral shuttles: "CAVU"
The shuttle buses taking mourners to Bush's funeral on Thursday morning displayed two special messages: "CAVU" and "Visibility unlimited." CAVU, an aviation acronym standing for "Ceiling and visibility unlimited," was a favorite phrase of Bush, the former Navy pilot who flew 58 combat missions during World War II. During one of those missions, Bush was shot down over the Pacific. But he clung to a life raft and prayed to survive. And he did. 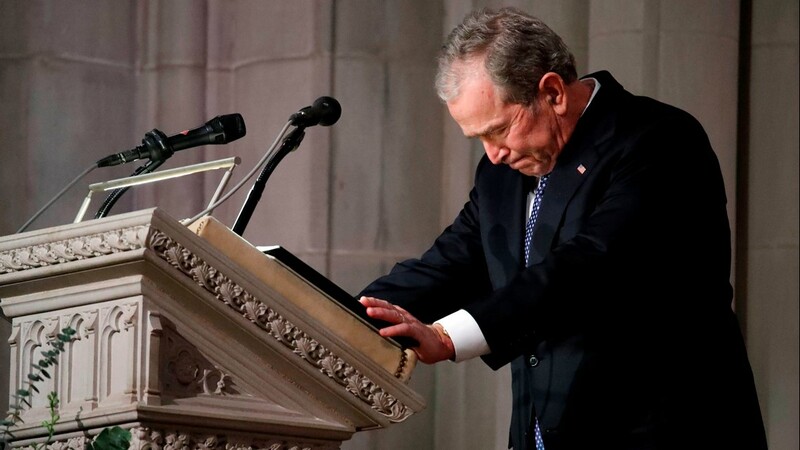 "God answered those prayers," George W. Bush said in the eulogy for his father Wednesday. "It turned out he had other plans for George H.W. Bush." Bush's body will be taken to College Station on a customized train – "Locomotive 4141," built in honor of Bush, who had a love for trains. Secret Service members early Thursday were performing final security checks at the railyard in Spring, where Bush's final journey will begin. Bush's funeral Thursday will be held at St. Martin's, the same church where the funeral for his wife, Barbara Bush, was held in April. The former President and First Lady had been members at St. Martin's for decades. Coverage of the funeral will begin at 10 a.m. Here's the full schedule of events for Thursday. The service will include eulogies from his grandson, George P. Bush, the Texas Land commissioner; and James Baker, the former Secretary of State and a longtime friend of Bush who was with him when he died. The Oak Ridge Boys, a country music group, will sing "Amazing Grace." Bush had requested that the group – his favorite – sing at his funeral, and they were scheduled to fly to Houston late Wednesday night after a show in Spokane, Wash. 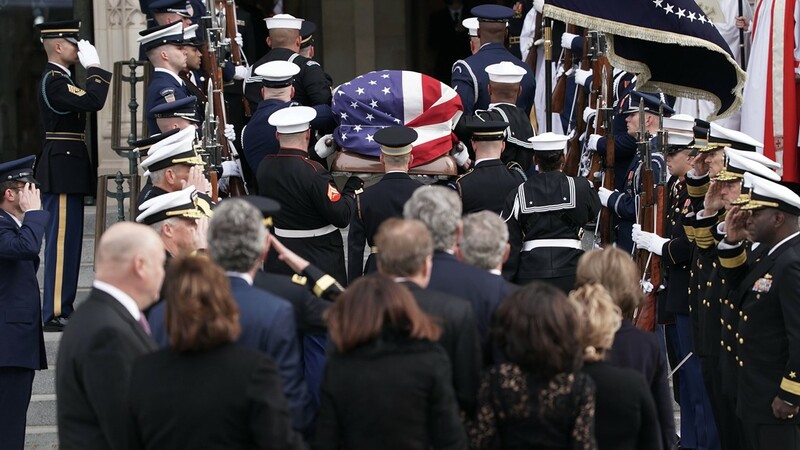 The first of two state funerals for former President George H.W. 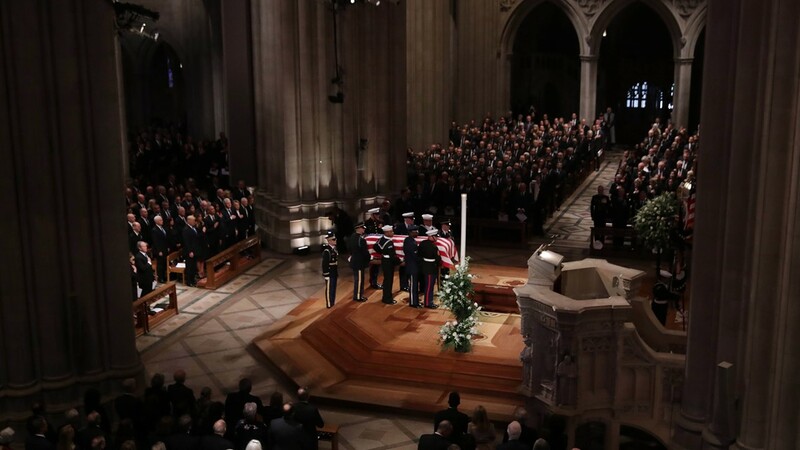 Bush was held Wednesday at the National Cathedral in Washington, D.C. The service, as expected, was an emotional one – with moments of levity also mixed in. 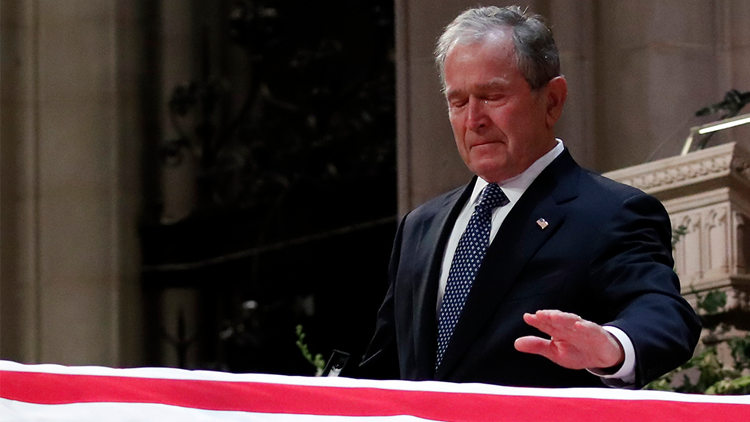 President George W. Bush's eulogy for his father was emotional but also insightful. He recalled their final conversation – and his father's final words before he passed – and thanked him for being "the best father a son or daughter could have." 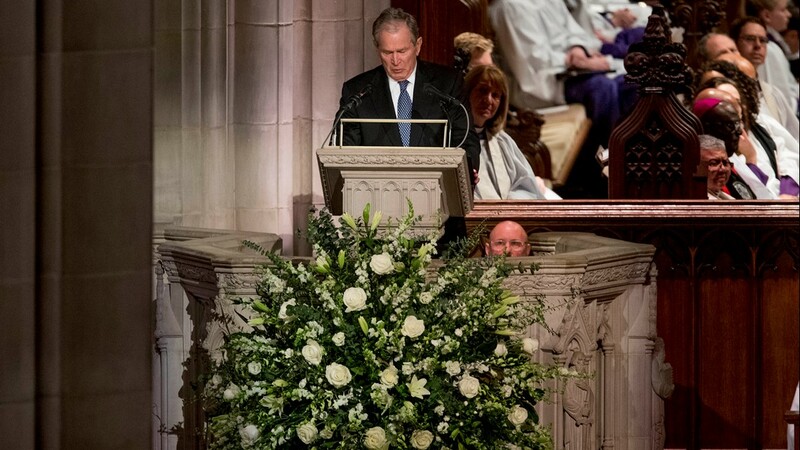 George W. Bush was the last to eulogize his father. He talked about how his father "knew how to die young," continuing to skydive even into his 80s. "One reason Dad knew how to die young was that he almost did it – twice," George W. Bush said, re-telling the story of how his father nearly died of a staph infection as a teenager and how he was shot down over the Pacific during World War II when he was 20. "For Dad's part, I think those brushes with death made him cherish the gift of life," George W. Bush said. "Dad was always busy, a man in constant motion. But never too busy to share his love of life with those around him." 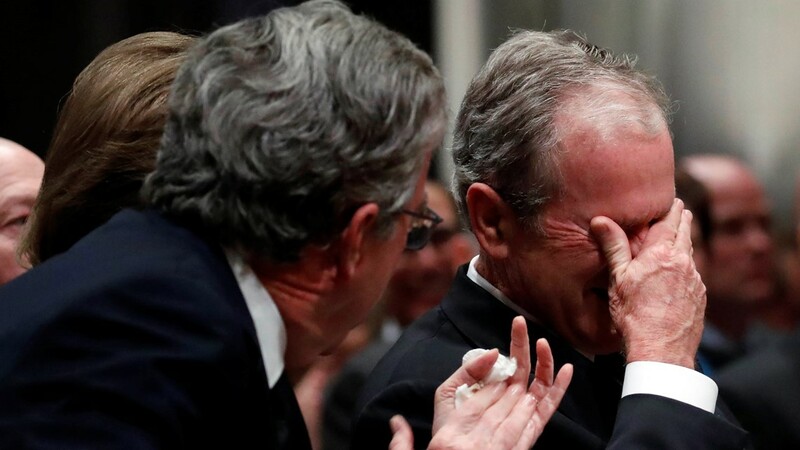 "The best father a son or daughter could have," – George W. Bush, in an emotional eulogy for his father. Former Senator Alan Simpson, a good friend of Bush, gave a heartfelt – and humorous – eulogy, praising Bush's humility. "Those who travel the high road of humility in Washington D.C. are not bothered by heavy traffic," Simpson joked. Former Sen. Alan Simpson praises George H.W. Bush's humility. Simpson said he was given 10 minutes to speak, a directive from George H.W. Bush himself, he joked. But it was a heartfelt 10 minutes. "None of us were ready for this day," Simpson said. Former Canadian Prime Minister Brian Mulroney, a longtime friend of Bush who was in office at the same time, lauded Bush for his character. "I believe it will be said that no occupant of the Oval Office was more courageous, more principled and more honorable than George Herbert Walker Bush," Mulroney said.He also praised Bush, as many other have, for his handling of the end of the Cold War and the fall of the Berlin Wall. "When George Bush was president of the United States of America, every head of government in the world knew they were dealing with a leader," Mulroney said. Bush's biographer Jon Meacham was the first to eulogize the former president, re-telling the story of Bush the fighter pilot getting shot down over the Pacific during World War II. He survived the crash but then realized that some of his fellow soliders had not. "He felt the weight of responsibility as a nearly physical burden," Meacham said. "And he wept." "Through the ensuing decades, he would frequently ask, 'Why me? Why was I spared?' And in this sense, the rest of his life was a perennial effort to prove himself worthy of salvation on that distant morning...there was always more lives to touch, more love to give. He never slowed down." 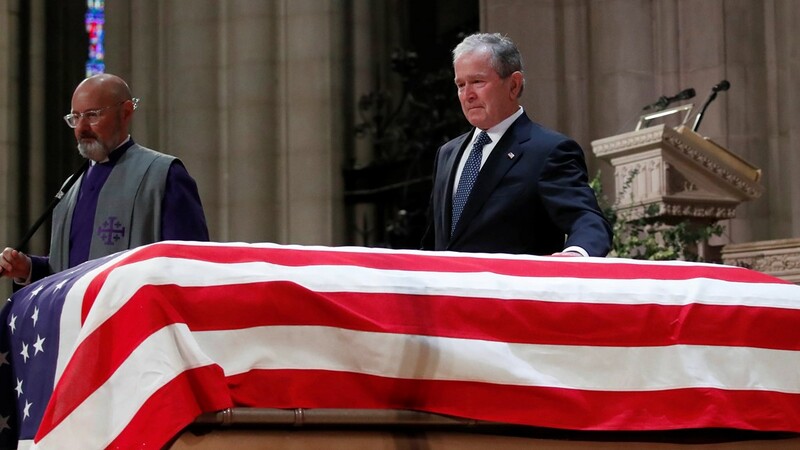 Meacham, who reportedly finished writing his eulogy two years ago, called Bush "America's last great soldier-statesman," in the mold of George Washington and others "who believed of causes larger than himself." The motorcade arrived at the National Cathedral and Bush's flag-draped casket was carried to the entrance, as his family looked on. 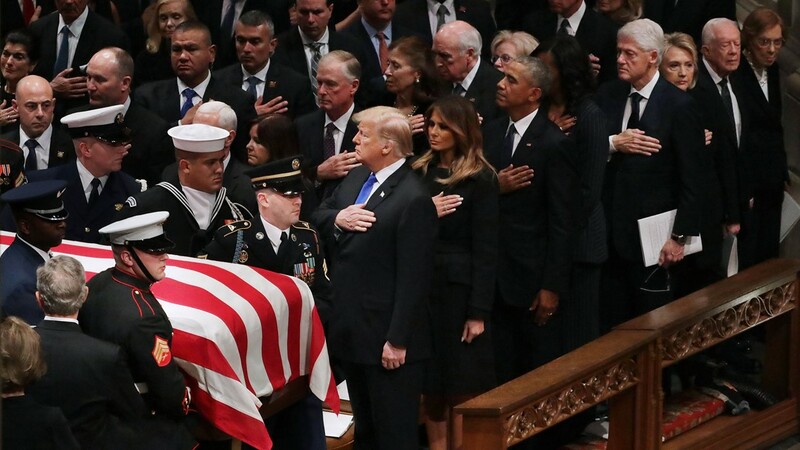 The Bush family was then seated – with George W. Bush shaking hands with President Trump and the other former presidents seated in a front-row pew – before Bush's casket was carried inside. 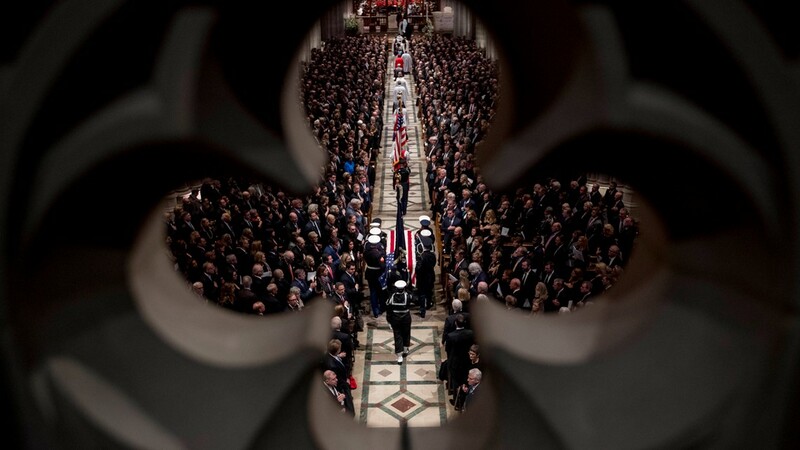 The casket of President George H.W. 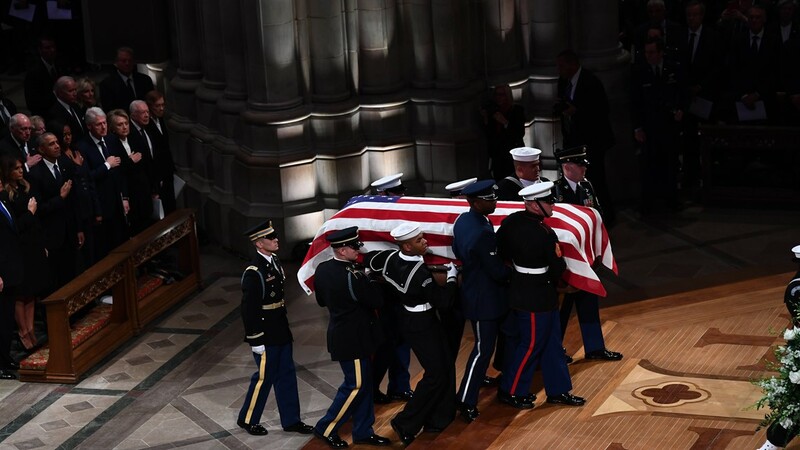 Bush is carried into the National Cathedral, where his funeral service is now underway. President Trump and former Presidents Barack Obama, Bill Clinton and Jimmy Carter at Geroge H.W. Bush's funeral. 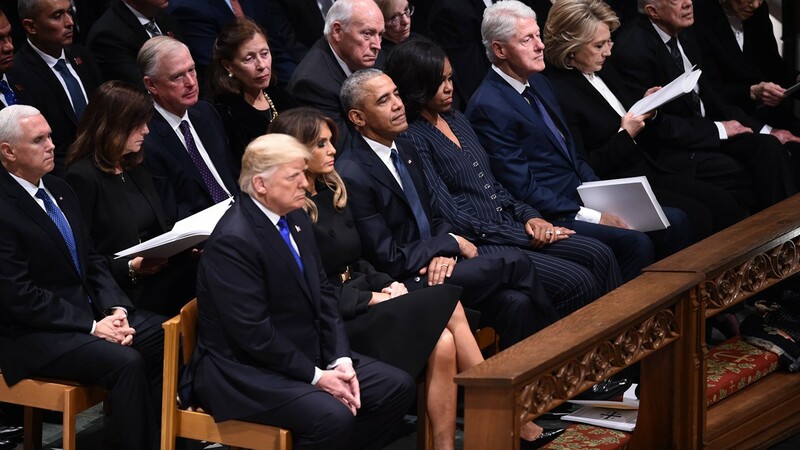 President Donald Trump and First Lady Melania Trump arrived, joining former presidents Barack Obama, Bill Clinton and Jimmy Carter on the first row of the National Cathedral. The Trumps were seated next to the Obamas. 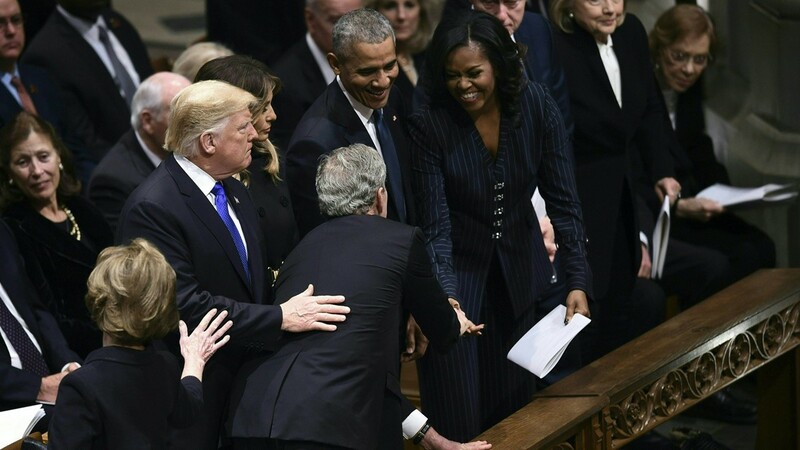 Trump sat down and shook hands with both Barack and Michelle Obama. It was the first time the president and former presidents were seen together since Trump’s inauguration in 2016. President Donald Trump and First Lady Melania Trump arrive at the National Cathedral for the funeral of George H.W. Bush. The Trumps are seated next to former presidents Barack Obama, Bill Clinton and Jimmy Carter. For the last two days, Bush lay in state in the U.S. Capitol Rotunda. In an emotional moment Wednesday morning, he was carried out of the Capitol for the final time. 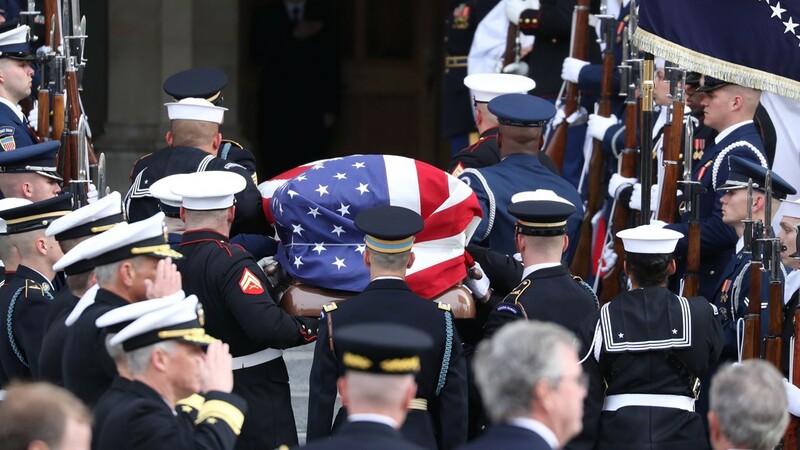 Service members carried his casket down the Capitol steps, as George W. Bush and other family members looked on. George W. Bush was noticeably emotional as his father's casket was placed into a hearse for the motorcade to the National Cathedral. 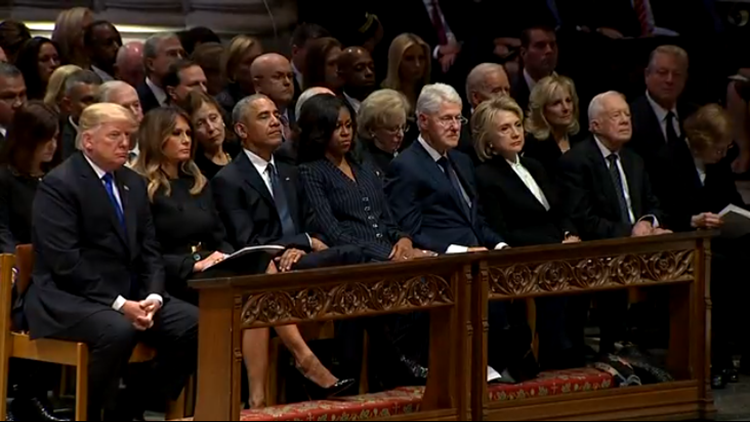 President George W. Bush and his family look on, as the casket of his father, President George H.W. 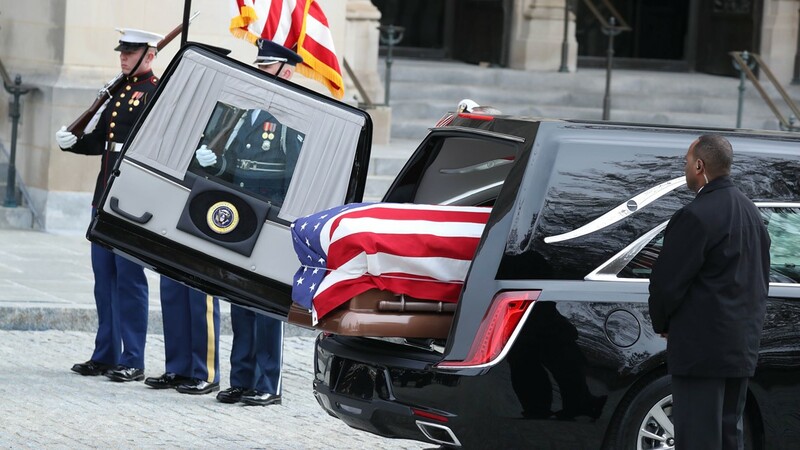 Bush, is placed in a hearse outside of the U.S. Capitol. Bush's son, former President George W. Bush, will deliver the eulogy for his father on Wednesday. George H.W. Bush's biographer, Jon Meacham, will also speak the funeral (Meacham will actually speak first), along with former Canadian Prime Minister Brian Mulroney. George W. Bush be the final speaker to eulogize his father. Bush spokesman Jim McGrath tweeted early Wednesday morning a tribute from the service members aboard the USS George H.W. Bush: A "Points of Light" with Bush's initial at sea. One of the cornerstone's of Bush's presidency was his founding of the Points of Light nonprofit organization, which encouraged and promoted volunteerism.